Find hotel near Setia Darma House Of Mask .. The Sukawati District is famous for its extensive population of sculptors, woodcrafters and other artists. That is why it is the best place to host this cultural museum. 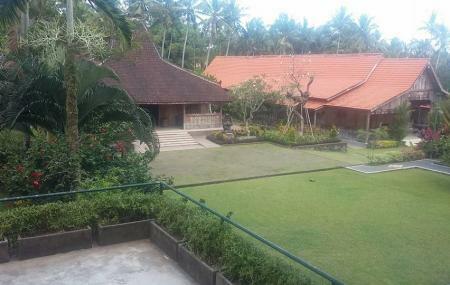 Five traditional Balinese Pavilions are spread over 1.4 hectares. Inside them, thematically displayed, is one of the world's richest collections of masks and puppets. Represented here are not only Indonesian cultural artifacts, but also those from Africa, China, Latin America, and Europe - over 5000 items in all. Among the type of artifacts you find you are the Indonesian leather shadow puppet, the Japanese bunraku dolls, 16th century European marionettes, figurines from Indian mythology, and one house dedicated to Balinese puppets and masks alone. All of these are described in detail at the museum and their significance is explained. How popular is Setia Darma House Of Mask And Puppets? People normally club together Kehen Temple and Tegal Wangi Beach while planning their visit to Setia Darma House Of Mask And Puppets. The museum was wonderful! It has a large collection of masks and puppets mainly from the southeast Asia region, but some from other locations such as Africa and Europe. Its very well curated and set in a very beautiful garden with several buildings, each containing a collection of original masks and puppets hundreds of years old. Its a bit out of the way, but worth the trip. We were the only people there so the museum employees gave us a private tour. Definitely the best museum in Bali! It has an amazing collection of Balinese, Indonesian and foreign masks and puppets. Every exhibit has a professional description in English, thanks to which you can really learn a lot about various theatrical traditions. I definitely recommend it, it's worth to be visited more than once! The place itself is really nice too, so if you need a break, you can sit down and admire the nature, and there is a coffee shop with good coffee and good prices. Fantastic hidden gem. Our guide did not know about it. Local philanthropists shares his private collection from SE Asia under 7 houses. Beautiful landscaped gardens. Best of all was the free private guide who spoke English and shared her knowledge with us. Do give a donation when visiting. Beautiful place and very nice guidance by local staff. If you are interested in Balinease culture, come to visit this place. There is private collection of Indonesian and worldwide made masks, puppets. And non touristic place at all. I saw only few people during my 2 hours visit here. Amazing Balinese (and Indonesian, as well as international!) mask collection, which were also well displayed. The museum is still undiscovered by tourism and the two times we visited the place, we had the museum to ourselves. Unfortunately, the Balinese masks hall is temporarly closed due to renovation, but still worth the visit.